Most firms nowadays use some form of backend document management system, to organize and track the hundreds (or thousands) of pages of documents every matter generates. 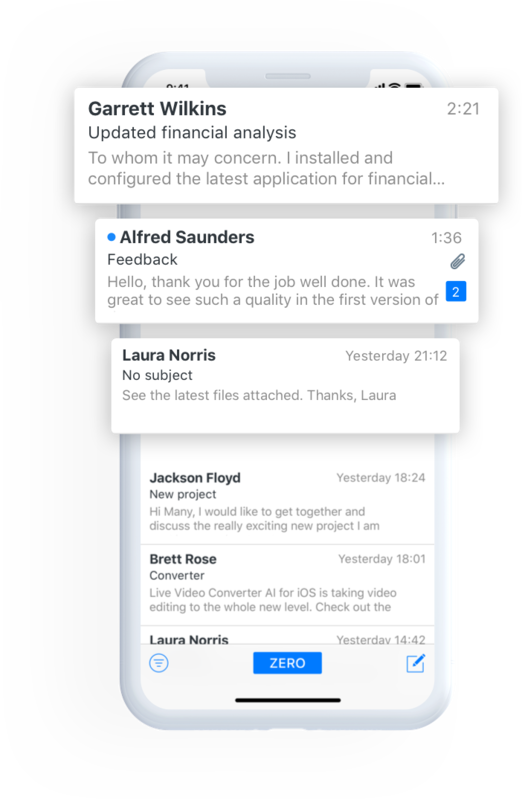 Unfortunately, DMS systems don’t usually play too nicely with mobile email systems. For example, a harried attorney in an airport in Des Moines, Iowa will attempt to open a link in an email to a critical document, parked deep inside the DMS. The link doesn’t work. The flight is leaving. And the only thing the attorney can do is plead with someone to send her a PDF of the document. Not with Zero. Zero works seamlessly with your DMS. Links work. Documents move into and out of their respective folders instantly, easily and intuitively. 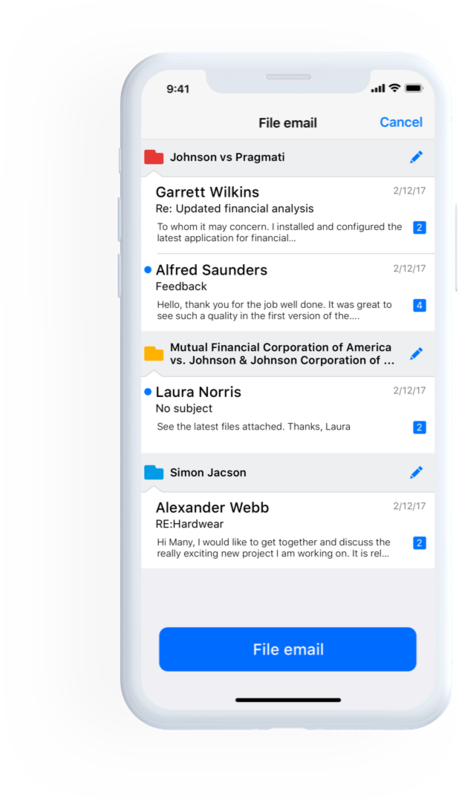 All the functionality of your DMS is now available wherever you are, and whatever you’re doing – it’s as close as your mobile device. A generation ago, law firms and lawyers usually worked in offices. Time was recorded by simply writing it down. Today, lawyers work everywhere and anywhere, on mobile devices, and until now, that time has been fiendishly hard to capture. It was typically just written off. Not anymore. 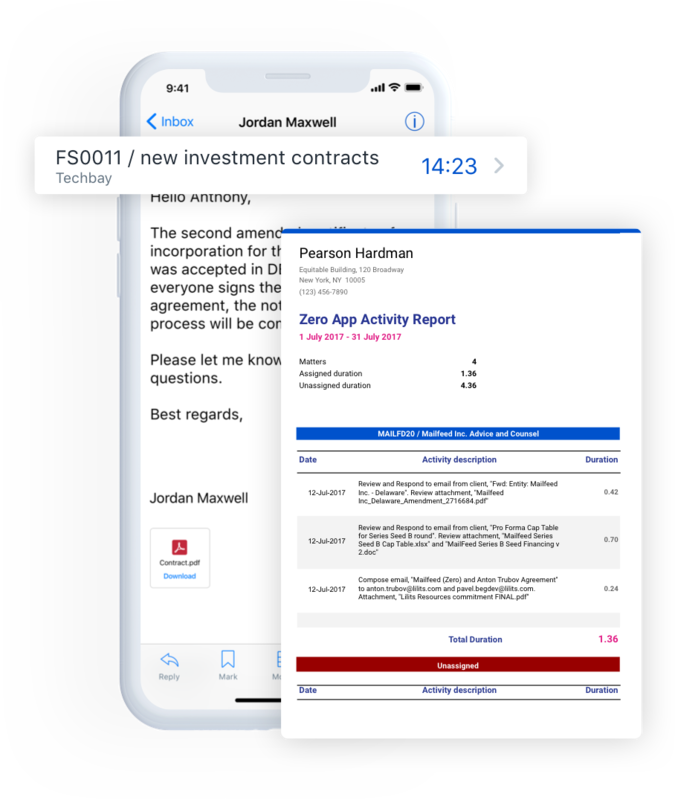 Zero’s unique combination of features tracks time spent on client-related work on your mobile device, and captures it. Following which, our A.I. reviews and analyzes dozens of parameters, and uses them to prepare in-depth narratives, exactly as you would if you were manually preparing an invoice. Zero can then forward these reports to you as a PDF for further review or prebill analysis, or send them directly to your billing system. The result? Time that used to be lost is now captured, and billable. A typical attorney using Zero recovers between half an hour and an hour per day. Multiply that by your hourly rate. Now multiply it by 20 billable days in the month. Zero delivers ROI on the first day you use it – and keeps delivering, day after day. One of the biggest chores attorneys have when working with DMS programs and email is the age-old task of filing. Typically, hours of valuable time every week are devoted to manually moving emails into the right matter folder in the DMS. This task is critical, it can’t be delegated, it takes forever, and research has shown that human beings become bored and start to make mistakes after filing around 45 emails. Zero uses A.I. to automate this task, with our predictive filing capability. 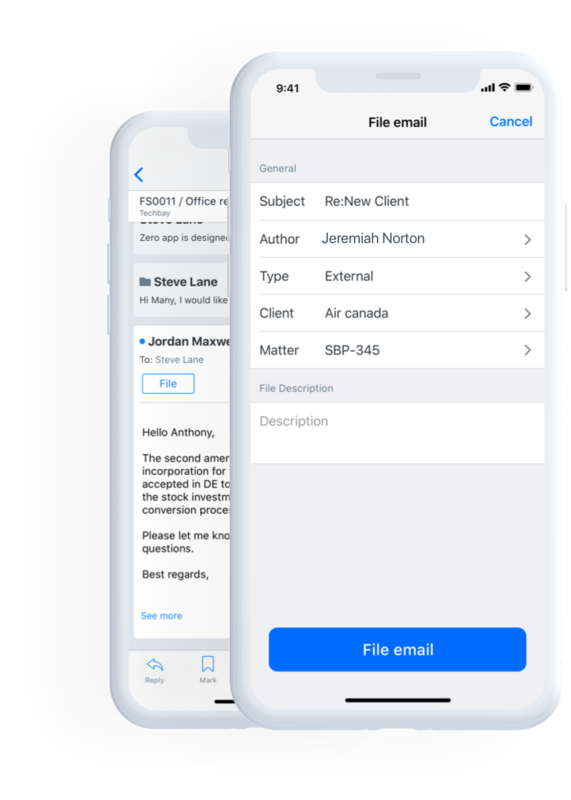 At the touch of a button, Zero will automatically review emails for whenever you specify – a day, a week, a month or any time period you select. It will then analyze your emails, and recommend a DMS folder destination. Zero’s recommendations are 95% accurate – better than a human – and unlike a human, Zero does not get tired or bored or make mistakes. The result? Filing that used to take hours now takes minutes, and is more accurate, too. Recovered time is now billable time. Email has always had very limited ability to organize an inbox. Emails typically can be sorted by date, by sender, by recipient, and a few other parameters. While this is fine for the casual or home user, an attorney with hundreds of emails in her inbox doesn’t have time to sort through them all manually, let alone read and evaluate them. The result: key emails are sometimes missed, and endless hours are devoted to trying to determine which emails are urgent and which can wait. Zero applies A.I. technology to this problem, and saves attorneys time, and therefore money. Emails are analyzed against dozens of parameters, and can be ranked against the characteristics that really matter instead of just the ones provided with your email platform. These include urgency of the email, requirement for a response, and other important factors. The result? Critical emails are identified instantly. Hours of time are saved. Work is more efficient. Stress levels are lower. And attorneys can focus on what really matters.